Over the last few years, mobile commerce has been showing outstanding growth rates. More and more customers choose mobile shopping as a convenient and fast way to make purchases online. Mobile commerce sales have increased almost twice from 2014 and they are expected to grow up to $35 billion by the end of 2018. So, it is no wonder the majority of retailers, including Magento store owners, have already stepped into the mobile commerce market. Magento is the world’s leading ecommerce platform chosen by industry giants like Nike, Procter & Gamble, Cisco, Ford and many others. With its rich and flexible functional capabilities, Magento, however, sometimes fails to meet speed expectations, especially on mobile. Slow mobile site loading and its imperfect performance have a crucial impact on conversion rates. Customers won’t buy from a store that takes ages to load and provides a poor user experience. So, if your website is not optimized for mobile, lost profits are inevitable. There are a number of techniques you can use to make a Magento-powered store mobile friendly. In this post, we share top 5 effective methods to ensure your website works impeccably on any mobile device. Keep on reading to discover them all! Today responsive web design is no longer an option – it’s an absolute must for businesses willing to take advantage of mobile commerce. Apart from its impact on search rankings and overall user experience, responsive design affects store performance too. When the website design is responsive, the content loads way faster on mobile devices, allowing potential buyers to browse through product pages fluidly. To the delight of the majority of Magento store owners, the platform is mobile friendly and adheres to the Mobile First approach. Thus, it provides a relatively simple way for Magento developers to turn a fixed website layout into a responsive one. Apart from that, Magento offers two responsive themes coming out-of-the-box. So, you don’t have to worry: implementing a responsive web design on your Magento-powered website is not that difficult. Once done that, you’ll instantly see how fast the website runs on mobile. Optimize all images on your web pages. There are a handful of online compression tools available that can help you do that as easy as ABC. Enable page caching using one of the proven tools like Magento Full Page Cache. Implement lazy loading design pattern. Accelerated Mobile Pages project, or AMP, is an open-source speed optimization technology introduced by Google. Comprising a set of rules and scripts, AMP allows reducing page loading time and so increase website performance across devices. Implementing Accelerated Mobile Pages is not that complex as it may seem. Google provides a second mobile theme that is already optimized for the AMP format. When you integrate AMP with your Magento store, the non-AMP pages of your site will get a reference so that to inform Google that the website is AMP-friendly. As soon as your website is re-indexed, the AMP pages will become available by means of Google cache. It is worth mentioning that you don’t have to convert all your website pages into the AMP format – only the ones loaded heavily with content. The less time it takes for a server to respond to an HTTP request from a browser, the higher is the speed of a website. To minimize server response time or time to first byte (TTFB), the first thing you should do is carrying out an audit of your Magento extensions. The number of third-party tools and plugins installed have a direct impact on TTFB, since they usually slow down the website performance. So, making an audit and eliminating the unnecessary extensions will help a lot. Good hosting is another thing you should ensure since Magento performance is tightly interrelated with hosting resources. In one of our previous posts, we shared some useful tips on how to choose a hosting provider. Ensuring fast and pleasant mobile experience is one of the top priorities for retailers who want to capitalize on mobile commerce opportunities. 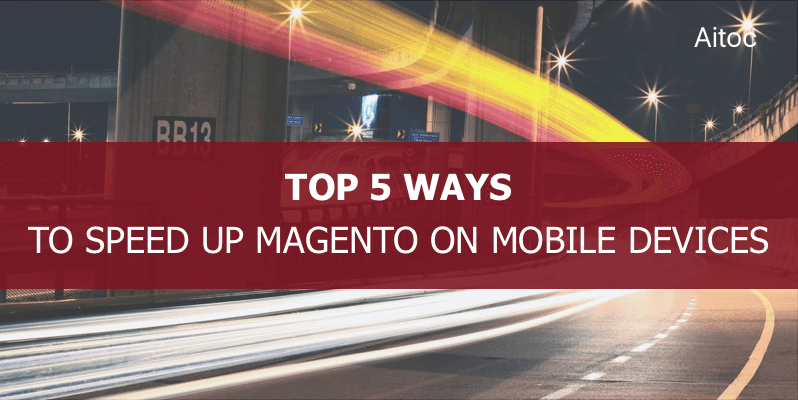 We hope that our tips will help you improve the way your Magento website performs on mobile devices to establish a solid mobile presence for your ecommerce business.